It would be ideal that the new members become part of the growing community that just so happens to be under the jurisdiction of the EP. The situation in America where multiple jurisdictions exist should not be replicated in the Philippines. Yes time will come and you will see Antiochian priests giving Holy Communion to both "Greek" Filipino Orthodox and Filipino "Antiochian" Orthodox in the Annunciation Parish in Manila. There are only three Filipino Orthodox priests (and 1 Greek Vicar) under the EP in the Philippines at the moment. Antiochian priests will be sent to "Greek" Filipino Orthodox parishes that are without regular priests (as many of the parishes and missions under EP in the Philippines are without parish priests and even lay missionaries). You might find these things "hard to accept" but you will see all of these things being fulfilled in your time. I will no longer post in OCnet. P.S. I have attended the Divine Liturgy at the Annunciation Parish in Manila and all I saw were less than 30 people inside the church and most of the time its almost empty even on Major Feast Days. So perhaps now you understand what the story of the beautiful but barren Fig Tree is trying to convey. God enlighten and bless you my Filipino brothers in Orthodoxy. Man, this is a very sad thing..
Im not really THAT aware of the situation, but wouldn't cooperation between the two, help more to plant Orthodoxy here in the Philippines? Honestly I find this squabbling quite fruitless.. (Im sorry for that)..
You're absolutely right Sohma_hatori. The problem is some faithful care only about jurisdiction, jurisdiction and jurisdiction. But we can not really blame them because they are not aware of what is really going on. You see, even the Filipino Orthodox Priest (EP) in Mindanao apparently gave you the wrong information last time? They are simply not aware. Now whose really to blame for this "fruitless squabbling"? The ordinary faithful (readers, laymen) or their Vicar or Administrative leaders who are keeping all the vital information and the truth from them? As far as I'm concerned, the Pastoral and Administrative leaders of the Antiochian jurisdiction are not witholding the necessary information to their faithful (you see, even the bank account number for the donation was proclaimed not only from the pulpit of the Cathedral in Australia but also published on the worldwide web ). Perhaps the Administrative leaders from the EP is aware that the majority of the faithful under their jurisdiction will find these agreement and arrangement very "hard to accept" so they witheld the information (in good faith) until such time that they (the Filipino Orthodox faithful under the EP) are ready to accept them. The Antiochians and the Greeks are brothers in Orthodoxy so what's all the squabbling? You know the answer and I repeat, some faithful only care about jurisdiction, jurisdiction and jurisdiction. I am happy regardless of what jurisdiction was chosen. It is truly miracle, just as it was a miracle when the evangelicals joined Orthodoxy in North America 20 years ago. I view it as a sign that the Holy Spirit is at work bringing more people into the Church. Yes, I also believe that the Holy Spirit is behind all these developments in the Philippines which was heralded as "a historic moment in the history of the Patriarchate of Antioch and the Archdiocese of Australia and New Zealand." 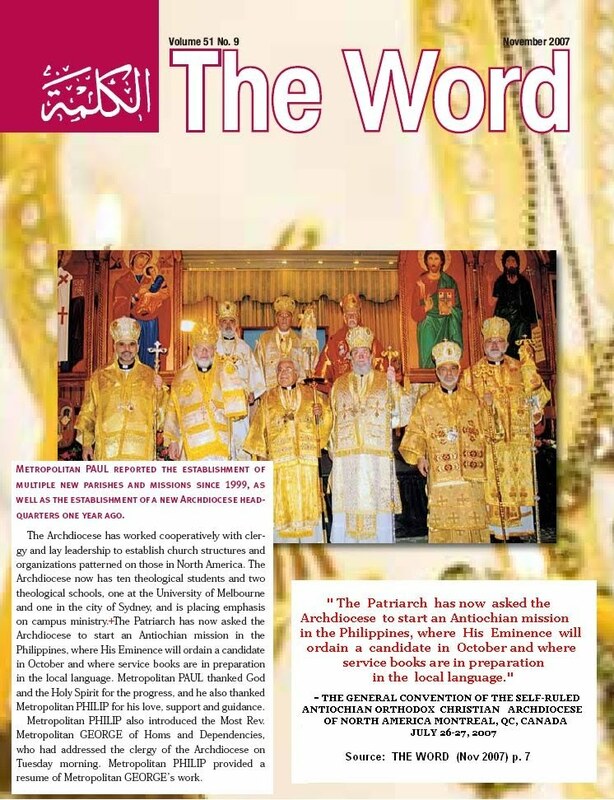 To download and read the November 2007 issue of THE WORD Magazine please click HERE. Yes time will come and you will see Antiochian priests giving Holy Communion to both "Greek" Filipino Orthodox and Filipino "Antiochian" Orthodox in the Annunciation Parish in Manila. There are only three Filipino Orthodox priests (and 1 Greek Vicar) under the EP in the Philippines at the moment. Antiochian priests will be sent to "Greek" Filipino Orthodox parishes that are without regular priests (as many of the parishes and missions under EP in the Philippines are without parish priests and even lay missionaries). If such cooperation between the two jurisdictions would work out, it would be glorious. You might find these things "hard to accept" but you will see all of these things being fulfilled in your time. What's "hard to accept" is the fact that Antioch appointed a NON-ORTHODOX as its vicar in the Philippines, which is a blow to the morale of the Orthodox faithful living in the country. I mean, several hundred Filipinos have been Orthodox for years and an evangelical is appointed as vicar?! It also makes it rather awkward for the EP vicar, a Greek Orthodox, to discuss leadership matters with an Evangelical--someone who has not even taken the Eucharist. This is not a very good precedent in my opinion. Filipiniana, at this point, you have not answered my question. Please let me know if you have been baptized/chrismated already. Yes brother, I have been Chrismated Orthodox even before your Parish in Sucat, Metro Manila was established. Sorry for my late reply. Where do you get this idea that Antioch would do something so uncanonical as to appoint someone who is not CURRENTLY Orthodox to be its vicar anywhere? This truly is bad precedent IF they have, but I somehow suspect that we don't know the whole story and that we may find that the allegation you're passing along is nothing but scuttlebutt. Can you tell us where you got your information on the Antiochian vicar in the Philippines? Thank you. Now I know why you are so excited about the recent development. You may have had unpleasant experiences in the past, and that you may be praying that the situation in the Philippines improve dramatically when Antioch extends its helping hand to Constantinople. We are not perfect, our leaders are not perfect, and as humans, all of us are prone to commit mistakes, lots of mistakes. We as Orthodox Christians are brothers in one family so we must always help one another, strenghten each other in the faith and strive to be united at all times. I'm deeply sorry brother if my previous post has caused you much pain. May God have mercy on us and bless us. ......you may be praying that the situation in the Philippines improve dramatically when Antioch extends its helping hand to Constantinople. We would like to thank everyone who has offered their Prayer for the Coming of More Orthodox Missionaries to the Philippines . We are now witnessing the fruits of your fervent prayers through God's mercy and blessing. the Trinity, one in essence and undivided." :'(Please pray that this may come to pass. Please offer itasan intentionwhen you celebrate The Divine Liturgy,asI shall continue to ask the Good Lord that His Church may come to us..
May you realize your prayers for yourself and all others there in the Phillipines. Lord, strengthen Thy servants in doing Thy work in the Philippines! May God's Will be done on Earth as it is in Heaven. That is what I have been told by my priest. Filipiniana can either reject or confirm this information. Either way, I have to learn to respect the decision of Antioch. I will pray for the conversion of more Filipinos and ask forgiveness and mercy from our Lord. An honest mistake based on assumption by the priest perhaps? I don't know if the priest (or the EP Vicar) has been corresponding directly with the "Vicar" for the Filipino Orthodox under Antioch or with the Primate in Australia. Did the "Vicar" told him so (ie., that he has not been Chrimated yet)? Did the Antiochian Primate in Australia said so? When the first Filipino Orthodox converts were received into Orthodoxy, it was the leader of the community who got Chrismated first and the rest followed after some time. What if leader or leaders of the Evangelical group requested the Primate that all ~6,000 of them be Chrismated at the same time in the Philippines by the Antiochian Primate and/or by the Patriarch of Antioch himself? That would be a glorious event in Philippine history! "Then they that gladly received his word were baptized: and the same day there were added unto them about three thousand souls. And they continued stedfastly in the apostles' doctrine and fellowship, and in breaking of bread, and in prayers. And fear came upon every soul: and many wonders and signs were done by the apostles." Mabuhay! I have been monitoring your discussion and I would say that everyone has it's own point of view and has it's own understanding of this so called "Conversions in the Philippines"... from the title of the discussion persei it seems that everyone does not really know if the said 6,000 figures of Evangelicals and member of Catholic Patriarchate of the East were already chrismated or so their leaders, namely Msgr. Jeptah Aniceto and Rev. Pascualito (Father Yitzak as mentioned by His Eminence Paul in his email to me). I am just wondering with this long thread none of you have touched the policy and rules of our Church which was set forth by the Great Church Fathers of the Church as what St. Paul also said that there may be order in the Church. I does not matter who violated first it's about who followed the canons... and does it make the Church to be canonical. If they were received already by Met. Paul, how? thru Chrismation? If yes, why they still bear their title as Reverend and Monsignor and wearing a white collar in front of an Orthodox priest? Why they were still allowed to practice their own rite? Does this mean that anyone who has his own liturgical rite can continue for as long he is under an Orthodox bishop? Instead of the Typka Service? I do not question the sincerity of His Eminence Paul but the process... then again, we need to go back to the Canons... what does the Canons says about it getting into another city or country which has established Orthodox Church already. If the Greek Church is lack of priest because money or people then other Churches can help on that by providing training and assistance to those baptized individuals under the EP and for me that is the true nature of brotherhood ad unity in faith and not the hypocrisy than we are all one and yet at the backdoor like this discussion praise people but not Christ... let his Church be in shame... Hierarchs to Hierarchs... we as laity have the responsibility to tell out Hierarchs this kind of disheartening event... glory of who’s Archdiocese? What’s next... the Russian, the Serbians? Who else? Yes, Philippines is for sale... my only thought is that we should act according to our conscience and meaning of true love and unity guided by the Seven Ecumenical Councils. the reason why our Churches seems to be no different at all to other Churches and accepted others as sister Church and the other lung.... have we forsaken the Church Fathers... abandon the Patristic teachings? I am not a perfect man; just like you... sinners and hoping to be forgive by Christ and find refuge in His Church! Can anyone here give a link to an official source verifying that a representative of the Antiochian Patriarchate did indeed appoint a non-Orthodox to be his vicar in the Philippines? I've now seen two posters on this thread assert this, but without official verification. To my understanding, this kind of appointment is a canonical offense of such serious nature (if the allegations prove true) that unsubstantiated accusations of this on an internet forum could be considered gossip. I don't want this thread or this forum to be a vehicle for such scuttlebutt, so please someone offer us official corroboration of these rumors, or let us all stop spreading them. Thank you John for your perspective. Are these people using their own liturgical rite or a Rite of another Church (Tridentine Mass, Syriac Qurbana, etc)? Welcome to the forum, John! Are you for real Mr. John? I don't know anyone from the Annunciation Sucat Parish by the name of John who resides at Caloocan City. Please note you mispelled Caloocan to Kalookan. Everyone from Caloocan City knows that their City is spelled Caloocan not Kalookan. Please be more careful with what you say or write next time. You are questioning the credibility of a person because of his spelling? You could have been a little bit more forgiving than that. I really don't know what your intentions are, filipiniana. I really don't. To my understanding, this kind of appointment is a canonical offense of such serious nature (if the allegations prove true) that unsubstantiated accusations of this on an internet forum could be considered gossip. Are you accusing me and John of spreading gossip? Please clarify. The observant reader will notice the seemingly interchangeable use of "Caloocan" (with two "C's") and "Kalookan" (with two "K's") in the different articles contained in this book. Those using "C's" were generally written before July 28, 1970. On that date, the Municipal Board enacted Resolution No. 106, requesting all department heads thenceforth to use the letter "K" instead of "C" in spelling the name of the city. The move was inspired by the wave of nationalism that engulfed the nation in the late 1960's. The Anglo-Spanish letter in a name that was obviously indigenous smacked of the snobbishness of the colonial master that made him write cauayan instead of kawayan, to give just one example. Surprisingly, it was the courts and the fiscal's office that led the other departments in complying with the resolution. School authorities refused to honor it (they still do), arguing that "C's" in a proper noun are not changed to "K's" when written in Pilipino. The fallacy of this assertion is that "Kalookan" is the proper noun, and the "K's" are not changed to "C's" when written in English. At any rate, ours is the only city in the country that is written in two different ways. If only for uniformity, it is urged that the correct spelling be used by all. It will probably take much longer than a decade to achieve total compliance, but the progress so far made is encouraging. This is also the practice of the Ecumenical Patriarchate, I have personally received correspondence from them as Reverend Subdeacon. There is liturgical diversity in Orthodoxy. The Patriarchate of Antioch allows for two different Western Rite forms along with the typical Byzantine form. If we go back to the canons then Met. Paul as a Bishop sitting on the Synod of the Patriarchate of Antioch and all the EAST is responsible for whatever territory such Synod would entrust him with since this is the traditional and canonical jurisdiction of his Patriarchate. All I ask is for official backing of any allegations that Antiochian bishops engaged in such a serious canonical violation as to appoint heterodox to be "clergy" before they were received formally into the Church. Without this validation such accusations are little more than rumor-mongering. It should be enough that the picture of this heterodox "vicar" appears above the bank account number where you're supposed to send your donations. If I am wrong, then ban me. "If I am wrong, then ban me." What is that supposed to mean? Why the confrontational nature? We have a responsibility to verify claims like this. People have posted inaccurate things before and it causes problems. So we take that seriously. Maybe I am wrong but this announcement and asking for donations is being made so that they can properly bring these groups in. Where are you getting this information that these men have been made "Vicars"? No where does the word "Vicar" appear in the sources you have provided us with. All that is being asked for is the source, no one is questioning your honesty. I don't see anything about a vicar in that advertisement. I see a notice that some people are joining the Antiochian Church, a pic of the leader of the group, and a request for money to help their relief efforts. I don't even know the leader pictured in the advertisement, so the picture is all I have from which to draw conclusions. Nothing in the picture or surrounding text even remotely indicates the man's background; therefore, I can conclude nothing about him. Theognosis, I'm not accusing you of anything, so please don't feel you need to defend yourself against me. I just want to make sure our public claims of hierarchical misdeeds are verifiable and accurate. Shouldn't you take it seriously when people accuse you of rumor-mongering and spreading gossip? Maybe I am wrong but this announcement and asking for donations is being made so that they can properly bring these groups in. Would you know the owner of the bank account number? If the person in the picture gets the donation, then he's the leader, i.e. vicar. Where are you getting this information that these men have been made "Vicars"? I've already answered that question even before I posted the image. No where does the word "Vicar" appear in the sources you have provided us with. All that is being asked for is the source, no one is questioning your honesty. Someone who is not Orthodox couldn't be a vicar, thus "vicar". I just want to make sure our public claims of hierarchical misdeeds are verifiable and accurate. I am just stating the facts. You are the one asserting that there were hierarchical misdeeds should my statements prove to be valid. Read between the lines. The person in the picture is definitely important, and the fact that the article does not mention his name or title is an indication that something is not right. and a request for money to help their relief efforts. They should ask for prayers, not money. It's another bad precedent in my opinion. Are you calling this person the "vicar" because he is the leader of this group wishing to come into the Church? Is Met. Paul calling this person the Vicar in his correspondence with you? Something else that I didn't think of and if this is the case can you please explain. No thanks. Reading between the lines often gets people in trouble. I agree with you that it looks suspicious. No one is accusing you of malice. Do you understand what it is like to moderate a site like this that gets 300-600 posts a day? Do you understand that people have threatened to sue us before? That we do all of this on our volunteer time? That we are often accused of prejudice by both sides of an argument at the same time? Please friend, do not take this personally. We are only inquiring what is going on. None of us have the foggiest idea what life is like in the Philippines and so it's a little hard to figure things out. Some things are being stated as facts by people on both sides. Speaking personally, I share your concern completely with any group of people coming in on their own terms to the Orthodox Church. However, I am cautious to judge at the same time. There is no need for you to say things like "then ban me." We are just trying to meet our responsibility of fairness and remember we will all face the ultimate judge, Christ himself. We really want to make sure that our site is not responsible for advertising mistruth whenever possible. No one on our moderation team is assuming anything you have said is not true. It is just confusing to try and figure out all the details and we are trying to be cautious. This is how Orthodox people are supposed to take all things, with a discerning spirit. Thank you for your understanding. We value your input on this site. Thanks for the clarification, Anastasios. Now that I have shared my concerns with all of you, I guess it's time that I leave this thread, which I believe is political in nature. To be honest, I don’t like discussing church politics with all its shortcomings. It really leaves a bad taste in my mouth. In this case, that bad taste has spoiled the party. Even so, I have no regrets. I am a man and act like a man. I don't ask for money and am no hypocrite. I have no intentions of becoming a priest or a bishop. I'm no party animal either. As for the Philippines, it is and always will be a Roman Catholic nation. For that, it is blessed--perhaps the most blessed in all of Asia. It is after all, the Pearl of the Orient Seas, the only predominantly Christian nation in Asia. To me, it doesn't matter whether the people are Orthodox or Catholic; what matters is that the Filipinos continue to pray to God, the Holy Trinity, amidst the turmoil and struggle. Hence, there should be no urgency in "converting" the Filipinos en masse. Perhaps the former metropolitan had this in mind when he made it clear that the Orthodox Church is not in the Philippines to actively convert Roman Catholics like what the evangelicals are doing, but to merely open up Holy Orthodoxy's doors for those who want to come in. By the grace of our Lord, I saw the doors open myself, and nobody pushed me in. Luwalhati Sa Iyo O Diyos! Luwalhati Sa Iyo! Doxa Si O Theo! Doxa Si! Glory To You O God! Glory To You ! After reading all the comments on my first post, it seems that there is one question that needs to be clarified. 1. Validity of the information that indeed Msgr. Jeptah and Rev. Pascualito were appointed as Vicars under the Antiochian Jurisdiction of Archdiocese of Australia, Oceania and Philippines. And to answer this one, it’s for everyone to find out. Below are their e-mail addresses which in case you may want to get a personal answer from them. As for me I decided not to push through with the Antiochian Mission and perhaps continue to attend the Greek Church and struggle to go on a 2-3 hours trip against 30 minutes away from the Antiochians because of this issue. I am not against any jurisdiction coming in the Philippines, as I have said, our country is too big for the Greek Church to serve… what I am questioning is the legality and canonicity of all this phenomena, the process because at the end this is a serious topic about unity of our faith and canonical standing of everyone that might be question and might be used against us by fundamental Christian sects in our country especially the INC or Iglesia Ni Cristo or Church of Christ (descendants of Arians) which is growing already in the US and other parts of the globe. I admire the sincerity of everyone but I cannot take joy in this historic event for the simple reason but grave violation of the Holy Canons which I mentioned in my first post which until now none of us here discuss about it in the light of all this things. In my opinion, the problem of administrative unity in America and other new lands is not jurisdictional or issue of ethnicities but issue of aligning ourselves according to the canons and patristic teachings which is unique to us and entrusted to us Orthodox Christians. I do know we have members of this forum belong to old style or who are Traditional Orthodox Christians who knows better about this serious breached of Canons more so this False Ecumenism (this is another topic of course). As I see, this is not an isolated case or just a simple problem of miscommunication between Hierarchs but intentional violation of the Canons. Let us be honest to ourselves brothers, if indeed those who call for unity in America are sincere enough, those who call themselves canonical Hierarchs, why until now they have not withdrew their Bishops in one city where multiple jurisdiction is prevalent. I my own opinion, it should be the Orthodox Church in America (OCA) who should be given presidency re on unity in America since they were the one autocephaly by The Russian Orthodox Church… but then again why, simply because they overlook what the Canon says on this matter and continue establishing their own diocese and installing their own Bishop… not the unlike the parishes under the Jerusalem Patriarchate, what they have only are representatives. How easy for one Bishop to authorize the use of liturgical rite foreign to her practice if not, not clear for Filipinos. Where is conciliarity on this matter now? When the western rite was allowed and the Liturgy of St. Gregory and other western rites were revived, it has the blessing of the Synod of the Russian Orthodox Church during the time of Patriarch Tikhon. I am saying these because the thing that we don’t want to happen in the Philippines which might creation confusion and sensationalize by fundamental Christian sects happened already by claiming the Philippines as one of Met. Paul Saliba’s jurisdiction and being him as the primate. Again, as a Filipino I cannot partake on this joy not even as an Orthodox Christian not because I don’t want my fellow country men to embrace Orthodoxy like Sohma Hatori or any Filipino who happened to read this. We want to have a correct understanding of Orthodoxy and live the ethos of this faith… we Filipinos are very religious but please don’t bring anymore confusion in our country as we are divided already by politics and dead spirituality of Western thinking and religion. I apologize if I offended anyone here. Rest assured that this is going to be my last posting. I hope and I pray like Filpiniana, that an Antiochian priest or Greek priest or Filipino priest will give communion to Greek or Antiochian or Russian or Filipino or perhaps ORTHODOX CHRISTIANS IN THE PHILIPPINES. What I want to have in the Philippines, is just simply Orthodoxy, the way of life that we members need to embark and practice (orthopraxia)… not by numbers but by quality! May this Great Lent and coming Pascha bring us Peace! What is happening in the Philippines is great news of the Holy Spirit's actions, so it is a little disappointing that some people jump to conclusions without even finding out the facts first. What happened to Orthodox charity and "believing the best"? The facts are that the negotiations between the EP and Met. Paul and Antioch have been long and far more complex than stated here. Secondly there is a very cordial working agreement, not animosity as suggested here at times. Thirdly, in no canonical sense have non_Orthodox been made "vicars", however, that term has been used out of respect for current evangelical leaders position. Fourthly, while everyone is aware of the problem of the overlapping of jurisdictions (we have it here in Australia too), Antioch (and the EP) work pragmatically *now* despite this, while working to resolve this uncanonical situation in the *future*. Fifthly, the services have been modified to make them Orthodox. Antioch has always had a broader range of services than some other jurisdictions. Really, assuming that a bishop would overlook this is a sad reflection on lay distrust of bishops. People should not read bad motives, uncanonical intent nor unOrthodox actions into anything that has happened. Fr. John D'Alton, Antiochian Orthodox, Australia, writing as a priest, not in any official capacity for the archdiocese. Thank you Father. Well put. I just hope that a bishop will be placed over this new group. Six thousand new souls are certainly enough people to qualify for assigning a bishop to oversee them in their country. One thing we learned the hard way, a large group of new converts NEED someone who is experienced in the faith to help them develop an Orthodox mind-set. They should not be left on their own to figure things out for themselves. I hope the EP and Antiochians work together on that issue and come up with a solution. The facts are that the negotiations between the EP and Met. Paul and Antioch have been long and far more complex than stated here. Secondly there is a very cordial working agreement, not animosity as suggested here at times. Thirdly, in no canonical sense have non_Orthodox been made "vicars", however, that term has been used out of respect for current evangelical leaders position. Our priests and bishops are given certain titles for a reason. Personally, I don't like calling the heterodox representatives as "vicars", just as I don't like calling the heterodox representatives as "bishops". I am relieved that you acknowledge the situation in other countries as problematic and uncanonical. As such, please inderstand that I don't like this situation introduced in the Philippines as well. Fifthly, the services have been modified to make them Orthodox. I think that's innovation, and I as a former Roman Catholic am tired of it. Again, I hope you understand. Antioch has always had a broader range of services than some other jurisdictions. Really, assuming that a bishop would overlook this is a sad reflection on lay distrust of bishops. Trust should be mutual. The voice of the Orthodox Christians in the Philippines must be heard. We want nothing less than the Divine Liturgy of St. John Chrysostom. Any "modified" liturgy must be rejected, with no compromise. Next time you want to know things, please do not post such questions on the internet- ask Met. Paul first, then this will save many wasted hours of passing around uninformed opinion and sheer gossip. Gossip is not Orthodox. Those who asked genuine questions without gossip should also email Met. Paul or whoever in future. Otherwise you can just add to speculation and feed the argumentative types. There's no speculation and gossip. The fact that you have confirmed my grievances is a testament to this, from the evangelical leaders being called "vicars" to the evangelicals celebrating a "modified" western rite liturgy. I will call up the local Diakonia about this matter and raise our objections directly in good faith to his emminence Met. Paul. I just hope that a bishop will be placed over this new group. An ORTHODOX bishop regardless of jurisdiction, yes! Six thousand new souls are certainly enough people to qualify for assigning a bishop to oversee them in their country. One thing we learned the hard way, a large group of new converts NEED someone who is experienced in the faith to help them develop an Orthodox mind-set. They should not be left on their own to figure things out for themselves. I hope the EP and Antiochians work together on that issue and come up with a solution. I will pray for this. When you say "WE" are you speaking in behalf of Greek Vicar Nikitas and the more or less 500 Orthodox Filipinos under the Ecumenical Patriarchate or are you speaking only on your own behalf and the more or less than 10 members of the local "Diakonia" in the Annunciation Parish? The voice of the few members of the "local diakonia" is NOT the voice of the more or less 500 Orthodox Filipinos under the Ecumenical Patriarchate. You should visit the Theotokos Orthodox Church in Bajada, Masbate to find out what your more or less 350 active Filipino Orthodox brethren under the Ecumenical Patriarchate are actually doing there. Please see for yourself and FYI, your brethren in Bajada, Masbate are doing these things with the special dispensation from the Hierarchs of the Ecumenical Patriarchate of Constantinople. Please ask your Greek Vicar for more details. Again, please be careful with what you say or write in this forum.